As a global travel search site, Skyscanner helps to inspire individuals and facilitates the comparison of travel options from more than 1,200 partners, allowing users to find the one that best meets their needs. Our mission is to be the most used and trusted online travel brand in the world – including in India. By all measures, the India travel market has experienced extraordinary levels of growth. Our exclusive Skyscanner Travel Insight data shows that from January 2015 to the end of 2017, there was a 97% increase in domestic trips per month on average, with international trips showing an increase of 72% for the same period. Multiple forecasts suggest that this growth will continue for the years to come. This is largely attributed to the growth in overall economy and travel consumption caused by the growing middle class, with the share of elite and affluent households set to increase from 8% (2016) to 16% by 2025. This increase in per capita income combined with growth in internet penetration, development of travel infrastructure in smaller towns and decrease in cost of travel due to the emergence and expansion of low-cost carriers (LCCs) promises tremendous growth potential for the Indian travel market. In India, the growing numbers of Online Travel Agents (OTAs) created a highly competitive marketplace, in which consumers have more choice than ever-before. Whilst consumers value the ability to choose, comparing travel options has become increasingly overwhelming. Therefore, to successfully serve our travellers, we need to help them cut through the noise created by the increased number of suppliers and identify the best result and offering based on their unique characteristics (e.g. loyalty card membership, willingness to stop-over etc.). This requires both users and partners to transition from a price-centric ecosystem, to one that focusses on value. Almost simultaneously, there has been a global transition from desktop towards mobile solutions - including the ever-growing use of voice and bot technology. In India, the number of mobile smartphone users is forecast to reach 468 million by 2021. This trend will force companies to rethink their traditional approach to distribution, and deliver offers, options and deals in a way that is easy to understand – through relevant search results, and a streamlined booking process. It will also drive airlines and OTAs to become more omnipresent through the application of these new channels and technologies once they have mastered mobile. Considering these market trends and characteristics, at Skyscanner we have begun to tackle two key challenges: how to deliver highly relevant recommendations, and how to develop a new retail environment that eases the shopping process and works across the growing number of mobile channels. To help travellers choose the best options through Skyscanner, we have introduced two scores: a Partner Quality Score, and a Flight Quality Score. Our pioneering Partner Quality Score, which was introduced last year, aims to help travellers by displaying a rating for each supplier based entirely on travellers’ booking experience. Enabling them to differentiate between options at the same or similar price points. 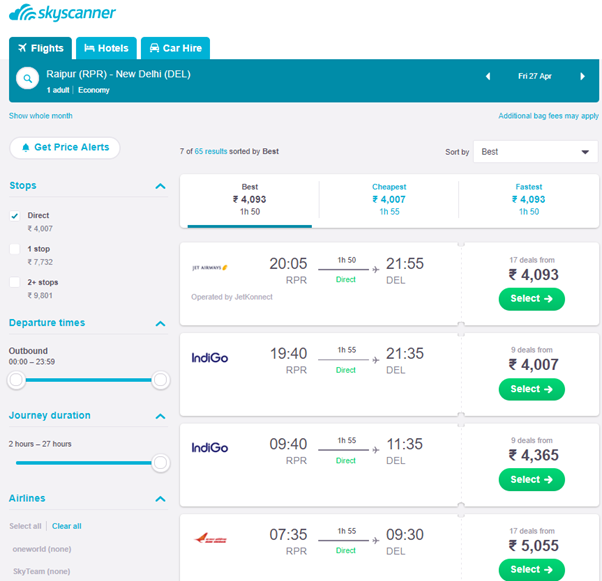 Our more recently introduced feature of Flight Quality Score seeks to expedite the search process by enabling Skyscanner users to start filtering and ranking results according to quality (Best) and speed (Fastest) in addition to price (Cheapest). Allowing them to assess value in a more straightforward way. In a further step towards a more tailored traveller experience, logged in iOS app users now have access to a Travel Wallet. The feature is designed to provide a central storage location for travel related documents: specifically, passports and loyalty cards at present. Continuing on this mission, we have a handful of teams working towards a solution that will remove the endless list of options commonly associated with metasearch and help travellers fast-track to their ideal itinerary. Ultimately, the goal is ensuring that travellers feel they understand their travel options and receive what represents the best value, every time. Evidently, the future of travel retail is about much more than a transaction. It is about surfacing the right (read: relevant) information at the right time to satisfy a user’s needs, as well as raising awareness of the products they may not have considered. This is particularly important on mobile, where there is limited space to display information. To allow users to seamlessly operate in this new retail environment, we have developed our own version of Direct Booking – a solution which is all about providing a flexible, optimized retail experience, with features which bring the right options to the top of the search in the increasingly small space of the mobile front page. It is designed to put the retailer’s brand at the forefront and ensure a direct connection to the consumer, regardless of the context of purchase. Diverging from current retail practices, which tend to emphasize the branding of the marketplace rather than suppliers, Skyscanner has taken inspiration from Tmall. It gives supplier brands the space and ability to control the display of their products – offering ‘store-fronts’ of sorts, with abundant up-sell opportunities built-in. Direct Booking also ensures a direct connection to the consumer, through a frictionless booking journey. Recognizing the bots and voice trend, Skyscanner also became an early entrant and pioneer of these technologies and has launched four major products in this space: a skill for Amazon's Alexa voice service; a bot for Facebook's Messenger platform; a collaboration with Skype for the new Skype bots platform; and a skill for Microsoft's Cortana. This required an evolution from delivering complex answers to simple questions, such as "who flies cheaply from A to B" to providing simple responses to complicated ones. These types of innovations in travel search technology allow Skyscanner and our partners to open up to brand new audiences and engage in new and exciting ways with existing ones. Making travel search as user-friendly and intuitive as possible, while embedding more into services and platforms that consumers engage with every day, will ultimately benefit our users, partners, and the wider industry. Interested in learning more about Direct Booking, or our other partner offerings?